The Family iBoard “app” is a uniquely private social network designed to help keep families together no matter where they live today, or tomorrow. 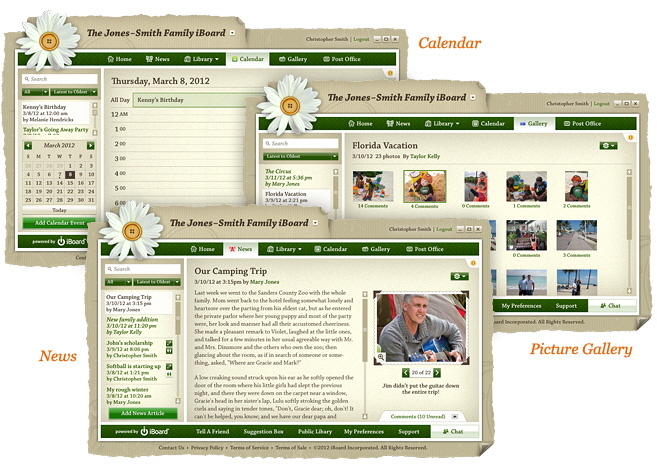 Just click on the menu to the left to see how Family iBoard can be your family's confidential news channel, interactive calendar, picture gallery, and scrapbooking library for all digital keepsakes, even a public post office to get more information on the subject and activities your family most enjoys. 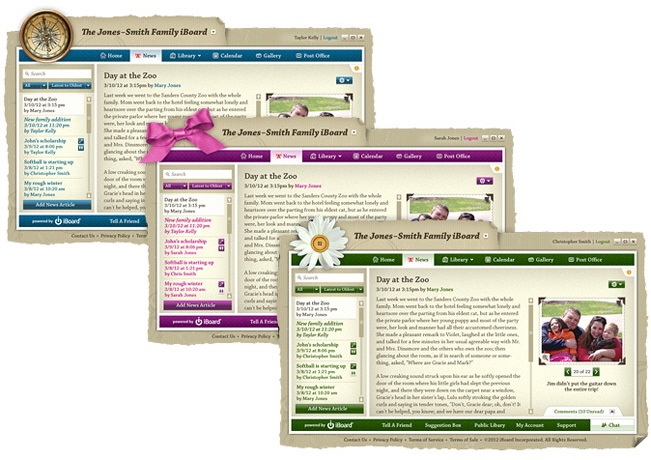 The Family iBoard is the most private and secure family social network on the market today. 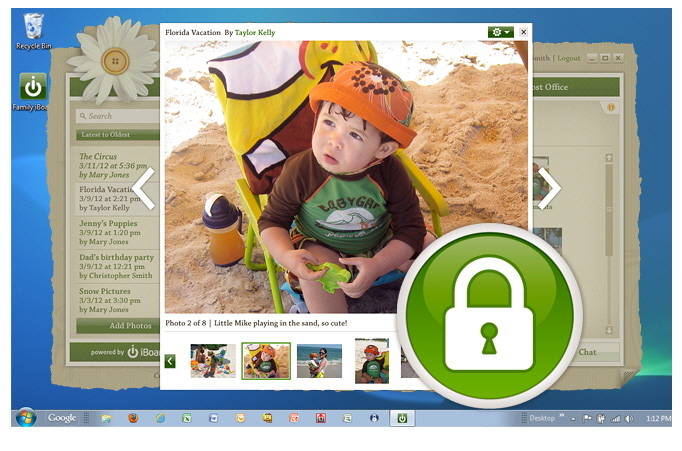 Family iBoard is not a website relying on just a password for protection, but a true private and secure “app” or virtual private network, where your precious content can only be accessed by authorized family members..
Encrypted Content - All content is digitally encrypted and viewable ONLY within the Family iBoard.  Content can only be viewed by approved members of your Private Family Network. Approved Content Downloads - Content you upload to your Private Family Network can be viewed, but not downloaded by any member without your permission. No content can be reposted (even by family members) to public social networks, unless they are granted permission. Cloud Network Storage - All content in your Family iBoard is stored and backed-up in our cloud storage network, assuring that all your family memories will always be there for generations to come. The Family iBoard allows you to reflect your unique family character and heritage. 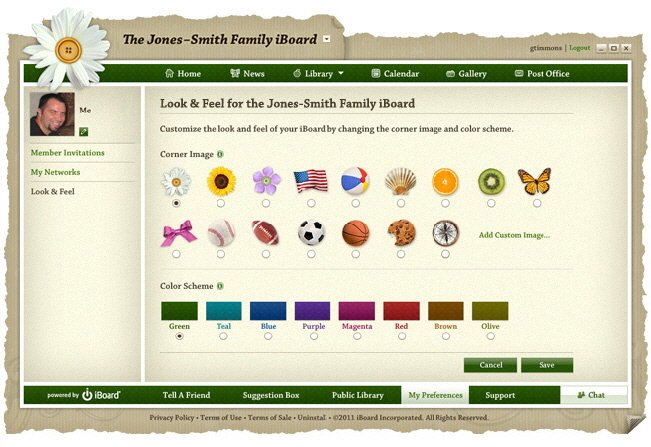 Family iBoard contains intuitive tools that allow you to create your families’ own unique look and feel based on taste, geography, heritage. Choose from a range of pre-selected corner images, and border colors, or if you wish use your own artwork or photography.